New allergies can develop – and existing ones can be made worse – by the hormonal imbalance your body undergoes during menopause. One of the most noticeable ways your body reacts is through your eyes, which can appear swollen. 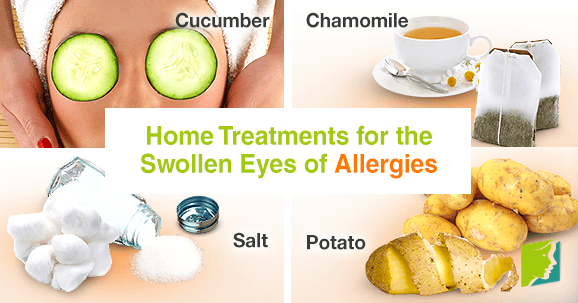 However, there are things you can do in order to reduce the swollen eyes of allergies. Continue reading to discover four natural ways in which you can use medicinal plants and kitchen staples to do this. The cucumber is one of the best-known herbal remedies in the fight against the swollen eyes of allergies. Cucumbers contain astringent properties, causing blood vessels to constrict, and they are also cool and soothing against the skin. Slice a cucumber and lie back and relax with a slice over each of your eyes for ten minutes to help reduce swelling. Chamomile tea has anti-inflammatory properties, which make it an excellent choice for helping to reduce eye swelling caused by allergies. Moisten some chamomile teabags and then leave them in the fridge until they are chilled, and then placed them over your eyes for ten minutes. While consuming too much salt orally can actually worsen swollen eyes caused by allergies, using it on the skin itself can really help to improve the appearance of your eyes. Try mixing half a teaspoon of salt into a cup of water, and dip cotton balls into this mixture. Lie down, place the soaked cotton balls onto your eyelids, and leave them there for around ten minutes. This should result in an immediately noticeable reduction in the puffiness of your eyes. Not many people suffering from allergies realize that potatoes have qualities that can help to reduce swollen eyes. The starch of the potato acts as an anti-inflammatory agent, which can ease irritated eyes. Peel the potato, wash it, and dry it carefully before grating it to be as fine as possible, and then place it inside a folded cloth to make a poultice that can be applied to your eyes. Coping with a new or heightened sensitivity to allergies can be the last thing you need as you struggle with a host of other symptoms caused by menopause. Fortunately, there are things you can do to minimize the physical signs of these allergies. By taking advantage of these four natural remedies, you can reduce swollen eyes that can accompany menopausal allergies, treating the principal cause of the symptom, hormonal imbalance.To handle swollen eyes of allergies,follow this link. A wheat allergy means a person reacts badly after consuming foods containing wheat or its derivatives.It is not uncommon to suffer from a wheat allergy, but it is not always fully understood.This article outlines aspects of this condition.